Spring is finally arriving, and there's a different sort of feeling in the air. The frigid cold of winter has been replaced by the promise of new life and growth, and a spring full moon is a magical time. It's a season that offers a chance at fertility and abundance, rebirth and regrowth. 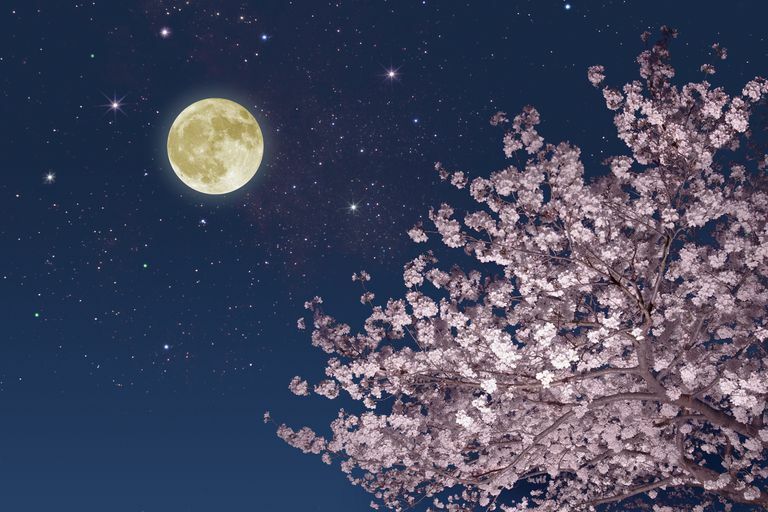 Whether you're celebrating March's Storm Moon, the Wind Moon of April, or May's Flower Moon, the focus in Spring's lunar cycles is that of the element of Water. Celebrate the seasonal full moon with a water-themed ceremony. Each participant should bring a cup of water, and you'll need a flower cutting to symbolize the spring. Include this as part of a larger celebration, or simply hold it as a single, short ritual. Along with the sun, water helps bring life back to the earth. It is the source of much of our existence and helps to cleanse and purify us. It can both destroy us and heal us. In ancient times, the well or spring was often seen as a sacred and holy place — a place in which we could truly bathe in the touch of the Divine. To celebrate the arrival of Spring's full moons, we acknowledge and honor the many aspects of Water. For this ritual, you'll want to go ahead and set up your altar in a manner appropriate to the season. Add things that represent this time of year, like spring flowers, fresh cuttings from the garden, or packets of seeds. You'll also need a small bowl of water and a large empty bowl. Ask each participant to bring a cup or jar of water of their own, representing a place that is special to them. Finally, you'll need a freshly cut flower (if you can't find one, or if your flowers haven't bloomed yet, a sprig of grass or a clipping from a newly blossomed shrub is a perfectly good substitute). If your tradition requires you to cast a circle, you may do so. Although this rite is designed for a small group, it can easily be adapted for a larger group or even for a solitary practitioner. This water is from the ocean, from my last trip to the beach. This is water from the creek behind my grandmother's farm. feel the energy and light and love*. May the light and wisdom of the moon guide you through the coming cycle. Take a few moments to meditate on the magical power of water. Think about how it flows and ebbs, changing all in its path. Water can destroy, and it can bring life. Consider how our bodies and spirits ebb with the tide, and how we connect to the cycles of water and of the moon. Remind everyone that we are all traveling in the river of life itself, and while we may have different backgrounds and beliefs and goals and dreams, we are all seeking the divine in ourselves and in those around us. By embracing the power and energy of water, we are able to welcome a pool of sacred space — ever constant, yet ever changing. When everyone is ready, end the ritual. You may wish to move on to a Cakes and Ale ceremony, or drawing down the moon.